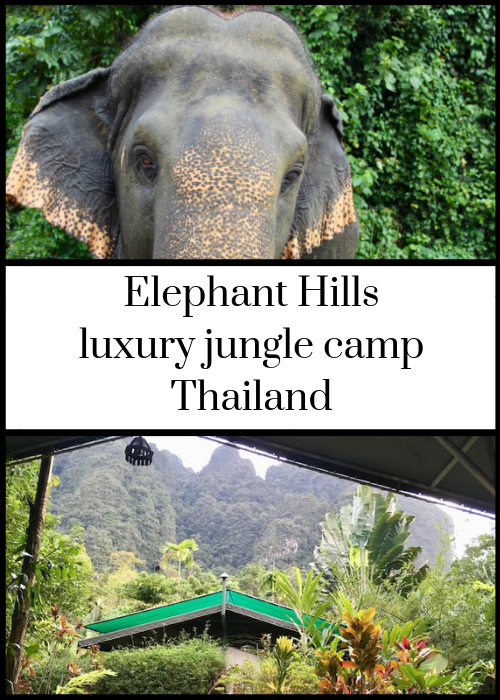 Home / Destination / Elsewhere / Asia / Thailand / What’s it like to stay at Elephant Hills, Thailand? 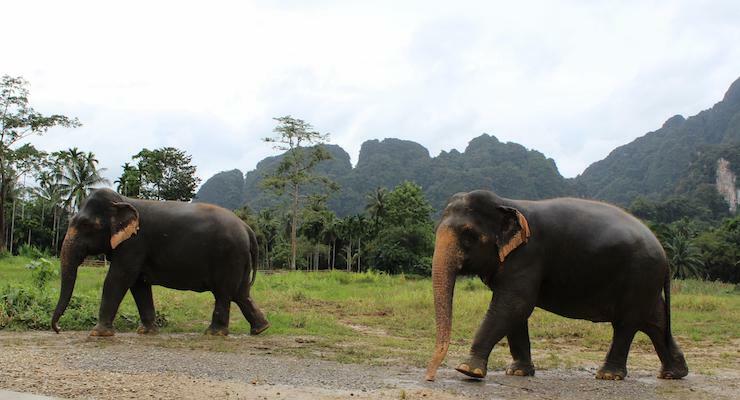 The second part of our family summer holiday was at Elephant Hills in Khao Sok National Park in Southern Thailand. Our flight from Bangkok (you can read about where we stayed in Bangkok here) to Surat Thani took just over an hour, and we were met there by a driver who took us to the Elephant Camp, around 70 miles away. 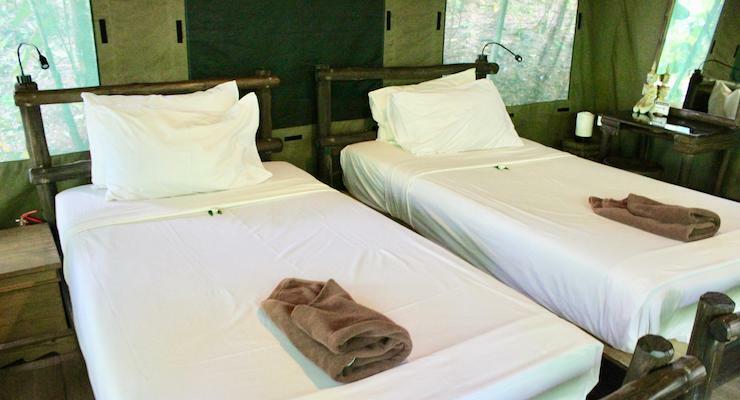 Elephant Hills has two luxury tented camps in the park’s ancient tropical rainforest: the Elephant Camp in the south of the park and the floating Rainforest Camp on Cheow Larn Lake. Both camps host guests on an all-inclusive basis, so meals, drinking water, activities and transfers are provided – you just have to pay for your drinks. There are planned adventure activities each day, such as canoeing, jungle trekking and, of course, the ethical elephant experience with the rescue animals who are cared for by Elephant Hills. The drive to the Elephant Camp from Surat Thani airport took a couple of hours. It was raining hard when we arrived, but it was still about 30 degrees. The rain stopped a few minutes after we arrived. We were welcomed by Tor, one of the friendly local guides, who gave us a drink and the WiFi code while we sat at one of the long wooden tables in the main dining/ bar/ reception area as our passport and credit card details were processed for check-in. Tor then gave us a couple of padlocks (to secure our tents) and shared some helpful advice about the local wildlife (always zip your tent up, and don’t leave your shoes outside or something may crawl inside them). 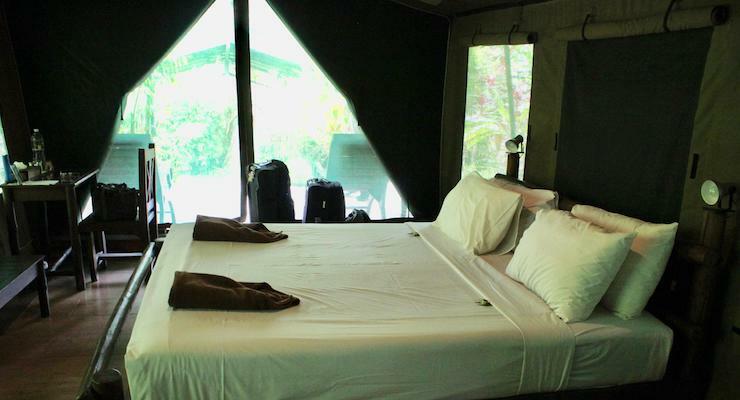 We then went to find our home for the next four days – two neighbouring safari tents. My husband and I were in tent number 58, with a double bed, and our kids (age 20 and 15) were a few metres away in number 59, with twin beds. I’ve camped many times in my life but I can honestly say that I’ve never seen a tent like these ones. They were so spacious and well-equipped that I don’t know if they really could be called tents at all. 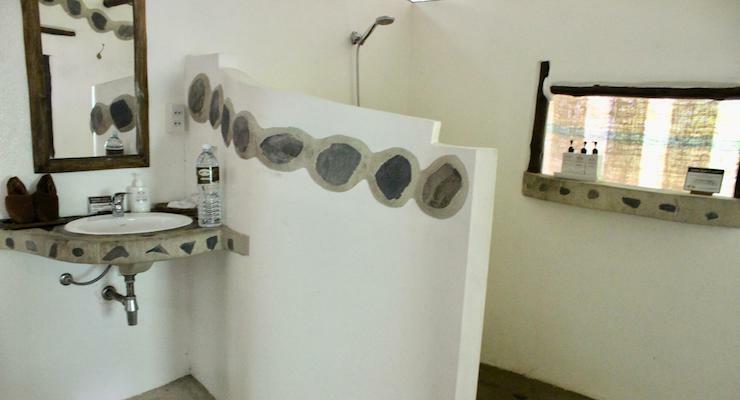 The tents each had a concrete floor, wooden furniture, proper beds, electric lights and sockets, a large electric fan, a safe, a kettle and a fully functioning bathroom, complete with flushing toilet, running hot water, toiletries and a hairdryer. Really, the tents had everything that we needed during our stay, except for air-conditioning – but the fans did a good job of keeping us cool at night, and during the day we weren’t in our tents very much as we were mostly out and about having adventures. I slept well here as it was generally quiet around the camp except for the jungle sounds. The food at the camp was mostly local Thai dishes and was very tasty. There was plenty of variety and there were vegetarian, shellfish-free (I have an allergy) and vegan dishes for me and my daughter. When we arrived Tor gave both of us a note in Thai explaining our dietary requirements, which was very helpful. Meals were provided as a self-service buffet in the camp dining area. There was always drinking water available with meals, bottled water in our rooms and a water dispenser in the main area to refill the bottles. If you wanted to drink something other than water, you could order drinks at the bar, and put them on your bill to pay for at the end of your stay. In the evenings my husband and I usually had local Chang beer with dinner, while our daughter generally stuck to water and our son often chose smoothies. At breakfast there was a self-service buffet as well as a cook making eggs and pancakes to order. I usually had either a vegetable omelette or fried egg on toast, orange juice, fresh fruit and yoghurt for breakfast. The stars of Elephant Hills are, of course, the elephants, who live in a protected area a short drive from the camp. The 12 elephants here previously worked in the logging industry, until this practice was banned in 1989. Now guests can observe the elephants up close and spend time washing and feeding them, under guidance from their mahouts. The elephants have a large paddock to roam in and a muddy water hole for swimming. There are no elephant rides at Elephant Hills, and they have a conservation program to help wild and domestic elephants in Thailand. They have won many animal welfare awards as a result of their ethical approach. (You can read more here about why you should never ride an elephant). I’m writing a separate post about this but besides the elephant encounter, there’s a varied schedule of gently adventurous activities for guests to take part in. Elephant Hills offer two, three and four-day tours. We booked a four-day Rainforest Nature Safari which included canoeing on the Sok River, exploring the mangroves by speedboat (where we were thrilled to be spotted by some curious monkeys), a visit to a local market, a long tail boat trip on Cheow Larn Lake, a trip to the floating Rainforest Camp and a jungle trek, as well as meeting the elephants. To get to the activities away from camp we travelled in an open sided bus. On our last morning our 15 year-old didn’t feel like taking part in what had been scheduled (a jungle trek) so he relaxed at camp and joined in with the buffet lunch while we were exploring the rainforest and eating food cooked over a campfire. 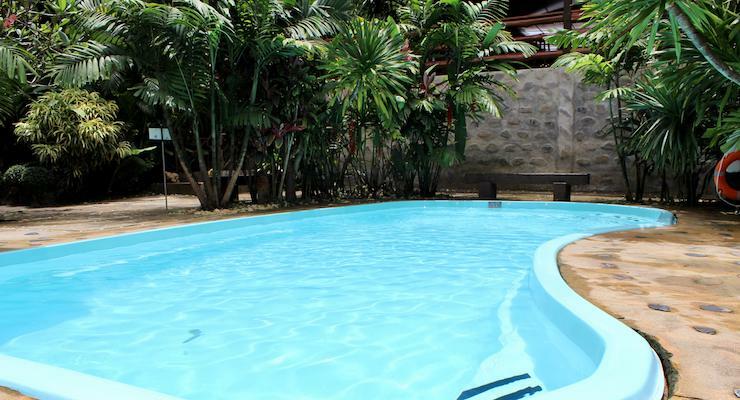 At the camp there’s an outdoor swimming pool for guests. Each evening at camp follows the same structure, and it all takes place in the central communal area. First there’s an educational film (about elephants or conservation), then a traditional dance display by costumed local schoolchildren (from schools supported by Elephant Hills), followed by a Thai cookery demonstration and dinner. The evenings are very sociable and relaxed, as everyone sits on benches at long tables, chatting about the day’s experiences and exchanging notes about their travels. Most of the other guests that we met at Elephant Hills were either families or couples, including some honeymooners. Elephant Hills provide a complimentary joint transfer service to and from various locations across Southern Thailand for guests, including to and from Phuket, Krabi and Koh Samui. They have scheduled pick up times, but if you need a transfer at a different time they can arrange that for a charge. So we booked our flight from Bangkok to Surat Thani to fit in with their pick up time, and then at the end of our stay at Elephant Hills our journey by road and ferry to our hotel in Koh Samui was arranged for us. At the end of our stay one of the helpful guides, Good, explained the arrangements for our journey and how to find our driver in Koh Samui. He gave us a card with a number to call in case there were any problems. We had no need for the card, our journey went very smoothly, and we arrived at our hotel with no hitches. 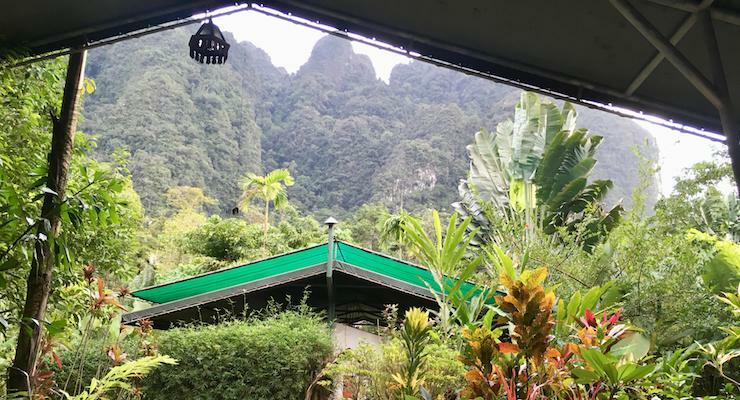 The Elephant Hills website says: ‘Khao Sok is not a typical malaria area, and usually free of malaria. However, we always advise to consult a tropical doctor before traveling to Thailand.’ We took advice from two different travel clinics in the UK before our trip, and both said that we didn’t need to take malaria tablets, so we didn’t. We were advised to take plenty of DEET insect repellent with us, so I bought several bottles of Lifesystems 50+ Spray Insect Repellent from Millets (along with some other useful kit), we used it liberally and didn’t have any problems. 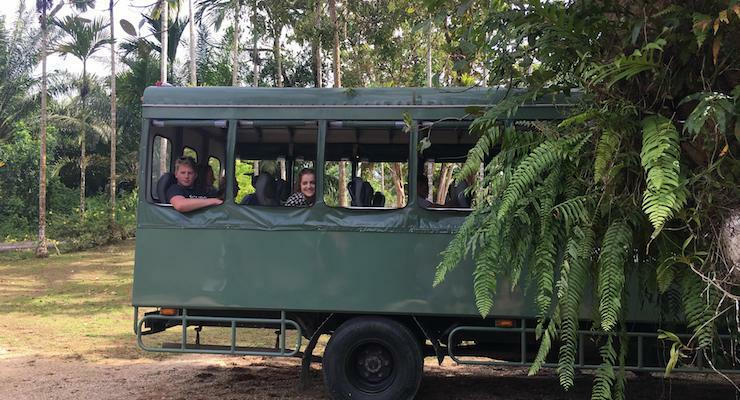 You can book direct with Elephant Hills (in which case each adult in your party will be given a free ranger safari shirt) or you can book as part of an organised trip with tour operators such as Kuoni or Hayes & Jarvis. Accommodation, meals, activities and transfers are included, the only extra costs are your drinks and tips to the staff. The four-day Rainforest Nature Safari which we did costs from around £550 per adult, £275 per child (4-15), depending on the season. Our drinks bill for the four of us was around £70.00. 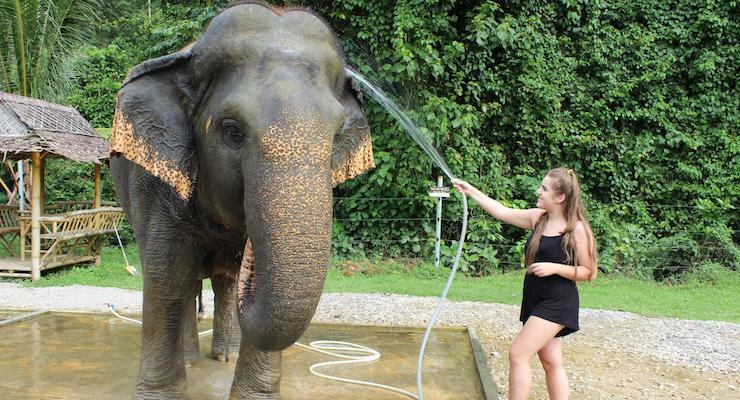 I really enjoyed staying at Elephant Hills and taking part in the experiences on offer. It was great to see the elephants being so well cared for, and thrilling to see some monkeys in the wild. Our accommodation was comfortable, the food was good, and the guides were excellent. The tour was very well-organised and run, and I’d definitely recommend it. Disclosure: We were given a discounted rate for our stay at Elephant Hills. This post contains some affiliate links, which means that if you clicked through and made a purchase I may receive a small commission. All opinions, images, video and words are my own, as ever. This looks like a fantastic experience! The price tag means that it will be a very special trip, though, maybe when the kids are a bit older like yours. Thanks for the super informative posts! You’re welcome – it really was amazing! Eek – the thought of finding something that had crawled into your shoe! But that aside, this sounds wonderful. Properly luxurious – and so good that the elephants are put first. Yes, it was great to see the elephants living a happy life!